Sometimes when I sit down to write a blog post, I get absolutely nowhere. Or rather, I start somewhere, and then the writing goes off on some tangent that is ill-advised, not suitable for posting, and not really focused on writing. It happens often. I’ve even started a folder called “blog posts gone bad.” I’m hoping that someday I’ll be able to recycle them for something. Mostly they are opinion pieces about how other people or current events offend me. My better angels advise against making them public. The process of writing a regular blog is still something I would recommend. Janis and I co-write this one, and the accountability of having a partner has been extremely helpful. Otherwise I’d have fallen off the wagon on about week three (I’ve fallen off a few blog wagons—so far nothing broken but my pride). Blogging can teach you to write when you don’t feel like writing, and to write when you feel like you have nothing to say. If you want to be a writer you need to write frequently, with discipline, in other words, even when you’d rather be doing the laundry. Sitting here, face to face with my resistance, another little voice wheedles: Why would anybody want to read what you’re writing anyway? Hasn’t everything that is wise or worthwhile or helpful already been better expressed by somebody more talented? I posed this question to a writing teacher once, and she said “absolutely not.” Her reason: because no one has been living in the particular conditions of your life, your unique circumstances. Jane Austen did not have to deal with facebook, or Twitter, or reality television. You can take a Jane Austen novel and recast it in a different time period and you will have an extremely entertaining new novel, such as The Guernsey Literary and Potato Peel Society, or Bridget Jone’s Diary, both examples of funny, moving and original writing based on Pride and Prejudice. (Note to self: maybe I’ll write a new version set in space, a Pride and Prejudice meets Battlestar Galactica). To some extent all stories are archetypes. All stories are prone to recycling. I think that is why we encounter so much delight when a story that is following a particular pattern suddenly takes a twist that we weren’t expecting. Writers realize that for a story to be compelling it needs to have enough familiarity within it to be resonant, and enough strangeness or difference to wake us up, to startle us out of our everyday thinking. 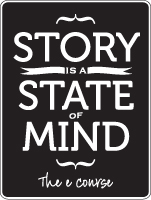 This ability to disrupt our cognitive routine, to take our mental Volkswagen and drive it into the ditch, is the power of great story-telling. Literature exercises and expands our imaginations, and imagination is fundamental to empathy. Empathy is necessary to create relationships, and being in relationship is fundamental to living and working together, to civilization. We are absolutely immersed in narratives all the time and often completely unconscious of it. Many of the narratives we believe are simply the opinions of other people, organizations, media, and institutions that we have absorbed by osmosis; stories that have permeated our culture so thoroughly that we can no longer even see that they are stories (this is where the practice of meditation can provide a great deal of insight). These stories, for better or for worse, form the soil in which our identity and decisions take root and grow. Real freedom means that we can recognize these stories for what they are, and be willing and able to rewrite them. Okay, clambering down from the soapbox now and back to writing. Here are some ideas for a creative free-writing exercise. Pick a favourite novel or myth and re-cast it in the present. Pick a new setting for it. Pick some contemporary characters (real or imagined) to play the main characters. If you were going to create this story as a movie, who would play the lead roles?